We cordially invite you to celebrate this Thanksgiving with your family and friends at Joia Ristorante from November 18th through 24th. Our Executive Chef Marco Aglitti has specially created an Italian-American Festive Menu that highlights the best flavours from both worlds! 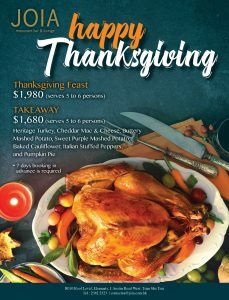 JOIA’s Thanksgiving Menu will feature a succulent American Heritage Roasted Turkey that serves up to 5 – 6 people, paired with delicious festive sides that include the Creamy Cheddar Mac & Cheese, Buttery Mashed Sweet Potato, Baked Cauliflower, Sweet Purple Mash with Festive Nuts, and Italian Stuffed Peppers. We will end this wholesome meal on a sweet note with the all-time-favourite Ricotta Cheese Pumpkin Pie. Memories are made when gathered around the table. Let’s make this Thanksgiving Celebration a memorable one at JOIA!